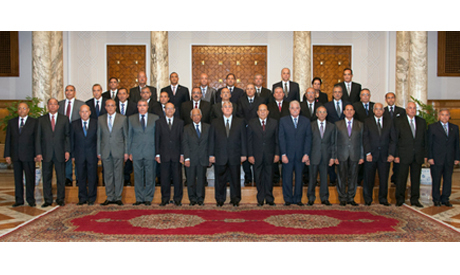 New governor appointments in Egypt by Interim President Adly Mansour brought a wave of criticism from groups and activists who decried the appointments of mainly former security officials to the posts. 11 out of the 18 new appointments are former military officials and another 2 are ex-police generals. A further 9 deputy governors were also appointed. Hossam Moenes, spokesperson for the leftist Egyptian Popular Current said on Twitter that the appointments don't "bode well." Moenes described the move as a "continuation of the lack of transparency and a disregard for consultations and absence of standards which likens this government to its predecessors." Mahmoud Afify, member of the 30 June Front – the front established after 30 June protests that led to former Islamist president Mohamed Morsi's deposition –expressed his disappointment with the new appointments. "The current government is following in the footsteps of previous Muslim Brotherhood and Supreme Council for Armed Forces governments by overlooking revolutionary figures as options, said Afify. "Without exception, all of the appointees never – not even for one day – sided with the revolution or change. The status-quo continues," he told Al-Ahram's Arabic news website. After the army removed Morsi from power following mass protests against him, it appointed a government comprised of many members of Morsi's opposition – including Prime Minister Hazem El-Beblawi. The army also offered prominent long-time liberal opposition figure Mohamed ElBaradei the position of vice president, which he accepted. The Salafist Nour Party spokesman Sherif Taha reacted similarly, telling Al-Ahram's Arabic webnews site that the appointments were "frustrating and disappointing." The Salafist party had announced earlier on Tuesday that it rejected participating in current governorate posts, refusing any "unelected" positions. Taha said that the move is a step towards "militarizing" the state, saying it was taken without consultation or participation from political forces. Despite taking part in drawing the transition roadmap which the military sponsored after Morsi's ouster, the Nour Party repeatedly criticized the new government. The Rebel (Tamarod) movement, which spearheaded the anti-Morsi protests that led to his ouster, stated reservations about the new appointments but stated it accepts them as part of the transitional process. Mohamed Abdel-Aziz, one of the movement's founders, told Al-Ahram's Arabic news website that the movement's acceptance of the move isn't a compromise but a necessity to avoid opening multiple fronts of confrontation in the current phase. He nevertheless added that he rejects certain appointments which are known to have been close to ousted president Hosni Mubarak's regime, saying the movement has come out against the Mubarak regime and the Muslim Brotherhood – from which Morsi hails– and that standards which political forces put forth for the selection of the governors were ignored. Abdel-Aziz said the priority is facing the war which he claims the Brotherhood is waging against the state and the people. The appointment of former interior minister assistant Samy Sedhom as deputy governor of Sharqiya province caused an outcry by a number of activists, who accuse him of having had a prominent role in political repression during the Mubarak era. Saying Sedhom was "responsible for torturing opposition activists in Mubarak's reign," activist Mona Seif of the No to Military Trials for Civilians Campaign condemned his appointment on her Facebook page. "During the clashes in Mohamed Mahmoud, Samy Sedhom called us thugs. Over 70 martyrs were called thugs and now you're appointing him deputy governor. Why don't you give him the Nile Medal [Egypt's highest state honour]?" she implored. Rights lawyer and activist Malek Adly said on Twitter that "the president should be aware that Samy Sedhom is only good enough for attacking girls during the judges independence protests in 2006 and killing revolutionaries in Mohamed Mahmoud in 2011. Sedhom was the assistant of the interior minister in 2011, in which clashes between protesters and police in Mohamed Mahmoud street off Tahrir Square in November of that year left 10 dead. Gamal Eid, rights lawyer and director of the Arab Network for Human Rights Information (ANHRI), also wrote on Twitter that Sedhom was behind the detention of and attacks on Mubarak's opposition. "What will be the oath of the likes of Samy Sedhom: I swear to almighty God to carry out the job I excel at which is repressing revolutionaries and supporting the Mubarak regime," Eid said mockingly. Days before his ouster, then-president Mohamed Morsi appointed 17 governors - 11 of them Brotherhood supporters - to head local governments. These appointments triggered nationwide controversy as Morsi critics charged that the move was part of his attempt to "Brotherhoodise" the state apparatus.